Wow! It might be hard to get anyone in the Detroit metro area inside on a day like today. However, if you wish to duck out of the sun for a bit of lit, author Mike Brogan will be appearing at Borders in Birmingham today, Saturday, May 29, 2010 at 2:00 PM. 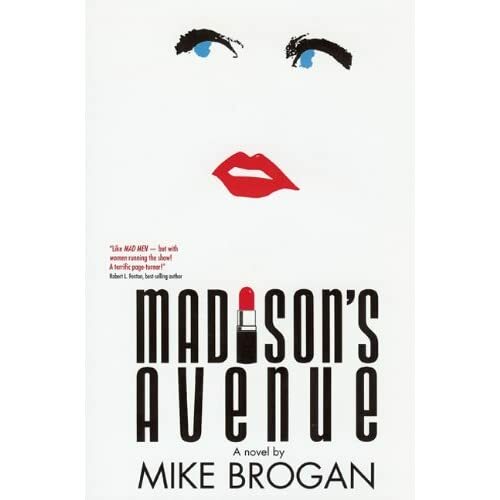 Mr. Brogan will be offering a discussion and signing of his latest book Madison’s Avenue. According to Mike Brogan’s site, the former Creative Director of General Motors and talented ad man now resides in southeast Michigan where he devotes himself to his one true love: fiction. Please call and confirm all appearance information before heading out the door. As American as Cherry Pie – Need I say more? Norwegian writer Jo Nesbo is a pretty cool character in his own right. Formerly known as a stockbroker and rock musician, the ever-morphing Nesbo now finds himself tagged as Europe’s new star of crime fiction. With his internationally acclaimed Harry Hole series Nesbo is fast becoming Oslo’s literary darling, and after flying through his newly released The Devil’s Star I can see why. I first heard about writer Jo Nesbo on NPR’s All Things Considered. The title segment Nordic Noir: Catching Olso’s Killer in ‘Devil’s Star’ highlights the author, his beloved Scandinavian people, and his contemporary thriller, The Devil’s Star. Though Star is the fifth of Nesbo’s eight thrillers that feature the haggard, hard-drinking Detective Harry Hole, this fifth translation was only recently released in the U.S. a couple of months ago. The Devil’s Star is an entertainment boon; not only does it read like an edge-of-your-seat flick, but Nesbo backs it up with smooth, nuanced detail of Oslo’s dark side. Keep an eye out for NLR’s upcoming quickie review of Nesbo’s latest, or link here to sample an excerpt. Here are just a few quick links from this morning’s early surf…sorry about the re-directs but as they say, any port in a storm. For those of you who love your sisters, try NPR’s piece on Laura and Lisa Ling’s book ‘Somewhere Inside’ on Fresh Air’s Ling Sisters Recount Laura’s Capture in North Korea. For those of you who love Ireland try Roddy Doyle’s Man of Ireland at the End of the Road which discusses Doyle’s new book, The Dead Republic. Doyle can also be found in this week’s The New Yorker with his fiction feature, Ash. For those of you who love Isabel Allende. For those who love pacifists, try this brief pice on HuffPost: ‘Weapons of Mass Instruction’. For those of you who love free books and own an e-reader, try this piece in today’s New York Times: Summer Reading, Electronic and Free. For those of you who love Sesame Street, link to Sesame Street eBooks. Say what!?! Brad Meltzer is a busy man, just hit his author page and you’ll see what I mean. Though Meltzer’s best known for his prolific novel writing, this time around the University of Michigan alumnus is switching gears with his first non-fiction work, Heroes for My Son. Upon the birth of his son Jonas, Meltzer began compiling a list of heroes he could share with his son. Eight years in the making, Meltzer’s list topped off with fifty-two people who live or lived the extraordinary and serve as examples of inspiration. ‘Heroes for My Son’ is the result of this lovely labor of love. Mr. Brad Meltzer will offer a reading and signing of his latest book ‘Heroes for My Son’ at Borders in Birmingham tonight, Thursday, May 20, 2010 at 7:00 PM. As always, it’s wise to double check all event information before heading out the door. Looking for a little Paris without the hassle and expense? Try Gail Vida Hamburg’s HuffPost article Paris on the Brain for a bit of armchair travel. Coincidentally, it was just yesterday that I started Americans in Paris by Charles Glass. This also got me thinking about books I’ve loved that were written on Parisian tableau. Topping my list, though on a much less serious note than that of Mr. Glass, has to be the work of expat Peter Mayle. While I haven’t read all of his titles, I can confidently steer you toward ‘A Year in Provence’ for a light and charming read. Also, you might recall The New Yorker contributer Adam Gopnik for his witty commentary on French life in the book Paris to the Moon. Either way, you’ll get good flavor and feel from those who have made Paris their home and written to tell the tale. There’s always great humor in the cultural snafu. Feel free to weigh in on French titles and perhaps we can compile our own list of les livres superbe, non?